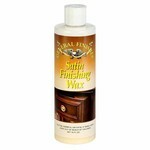 Satin Finishing Wax is a special blend of waxes designed to give oil-finished woods a rich luster. It can be used as a polish for rubbing out new finishes or as a scratch-remover for worn surfaces. It works well over both oil- and water-based finishes. Polish with a soft cloth, wiping away the excess in the direction of the wood grain. Buff off excess with a buffing or sanding pad (see below) in the direction of the wood grain. The higher/finer grit you use, the easier it will be to achieve a high-gloss finish. Do not sand "dry-on-dry" to remove scratch marks. Add Satin Wax as a lubricant on the pad AND on the surface of your project, then spread smooth with a rag.